FabSugar spots the bags to have at Fashion Week. 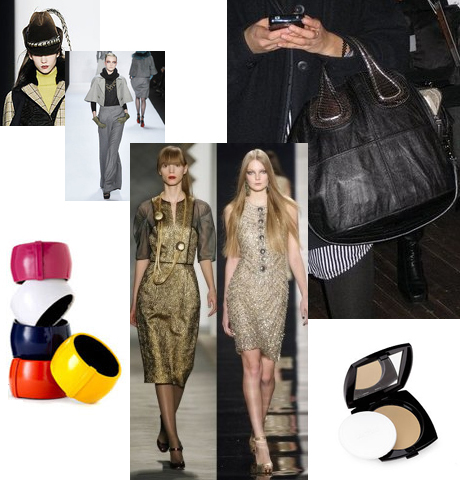 Stylehive NYFW Trend Report: Fall Goes Glam With Gold. Shop spring's top 10 trends with over 150 must-haves at StyleBakery.com. Stiletto Jungle shows you how to score 50% off Christian Louboutin shoes. Bag Bliss asks: would you wear a designer-inspired bag by forever21? Bag Snob has the hottest bag of the season: The Goya! The Ten Best Sites for Emerging Fashion Desingers. Only on Fashion Indie. Papierblog looks at a first time experience during fashion week. Grab a ringside seat! It's time for Second City Style's Celebrity Style Smackdown. Shrimpton Couture apologizes to her guy for falling in love with Michael Kors. Styleaholic Najwa Moses' trend alert: luggage sized handbags! 55 Secret Street says hello to Lancome's Beauty Bye-Bye - the place to go for your beauty must-haves before they are officially discontinued. A beauty quick fix with Beauty Snob! eBeautyDaily has a few spring beauty essentials to get you thinking in the right season again.